Initially I was told of the Sandefjord Whaling Museum by a lady who worked in a local hotel. Her husband had visited the museum as a youth and recommended it highly. I was also to learn of a surviving whale catcher, the "Southern Actor" which is berthed in Sandefjord and takes passengers out for trips in the Summer months. 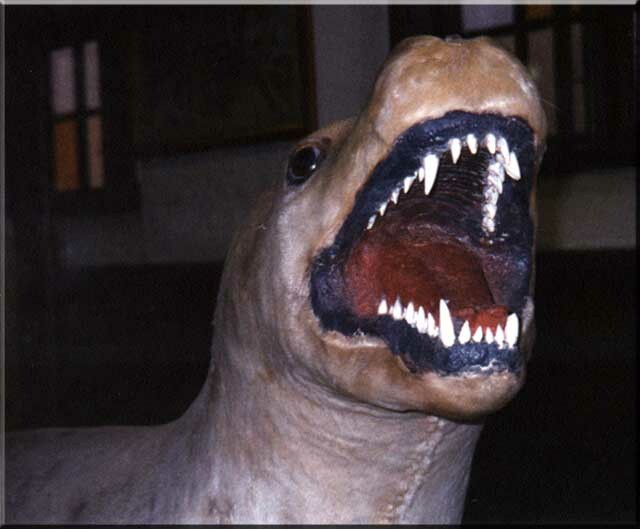 The "Southern Actor" is part of the Sandefjord Whaling Museum. 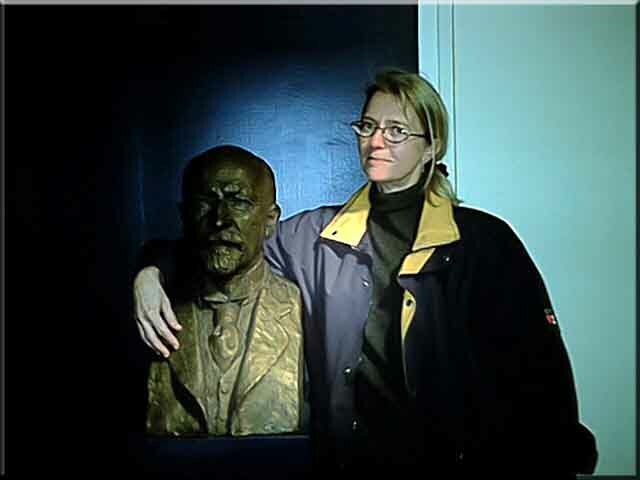 The bust shown here in the Kommandør Christen Christensens Hvalfangstmuseum in Sandefjord is the original of the one to be found in the Grytviken Whaler's Church in South Georgia. 1. Leader of the "Jason" expeditions to (at the time) the unknown Weddell Sea. 2. Skipper of the "Antarctic", an Otto Nordenskjöld expedition in 1901-1903 to the same area. 3. Founder of the whaling station at Grytviken in 1904. 4. Leader of the "Rosshavet" expeditions in 1923 and 1924, which opened up the Ross Sea for whaling. Captain Larsen was also instrumental in making "Pelagic Whaling" possible. The museum houses exhibits from different types of whaling from the Bronze Age to the present day. There are models of ships and shore stations, harpoon guns and the history of their development, a Natural History section with a stuffed animal and bird collection, a reference library and a large exhibit of the bow of a whale catcher. A twenty-five minute video also runs during opening hours. We can see one of two Tri-Pots or Cauldrons that were used to render the oil from the seal blubber. Normally two cauldrons would have been joined together and bricked in to make a cooker. (Note the removable side plates.) One would run into the other, then into a settling container. 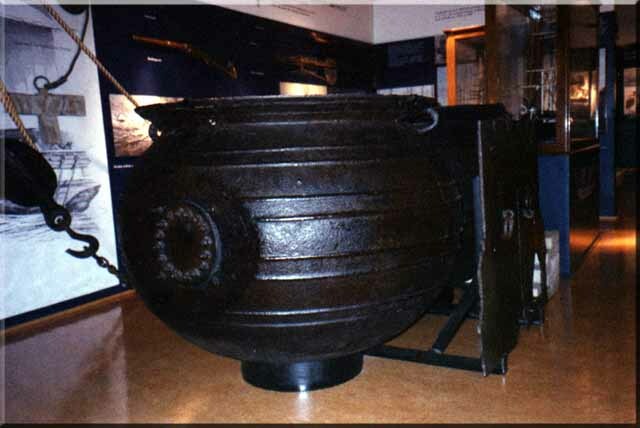 The two cauldrons in the exhibit were found at Cauldron Bay, South Georgia, around 1800. 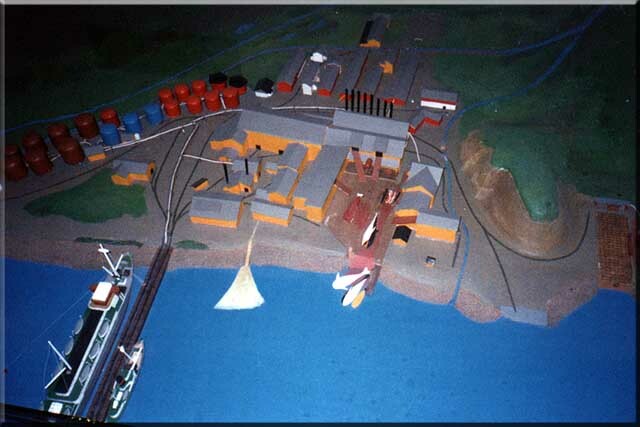 This model of Stromness in the Whaling Museum shows the whaling station before conversion to a repair yard in 1931. The models show a lot clearer what the layout was like in comparison to a photograph. 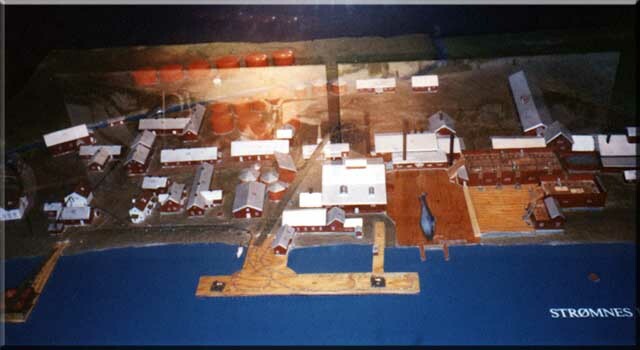 This model of the whaling station at Husvik can be seen in the Atlantic Hotel, Sandefjord. The Hotel has on display many items that there is no room for in the museum. Outside in the grounds are some of the larger exhibits such as bone saws etc. In this model of the bow of a whale catcher, the gunner stands ready to fire the harpoon gun. The gunner was also the skipper of the ship. A good gunner/skipper was in great demand and could command a very high salary. 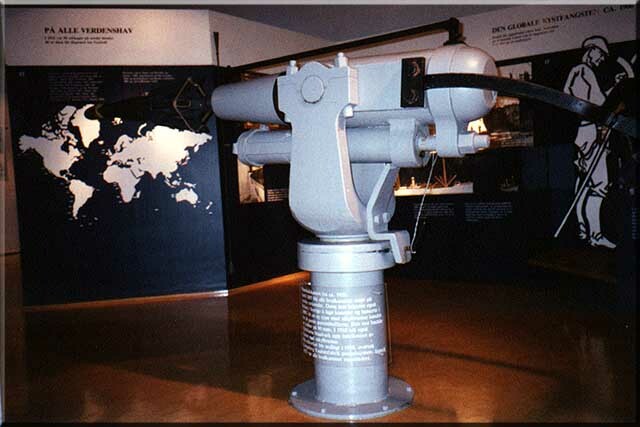 The museum has many examples of harpoon guns. 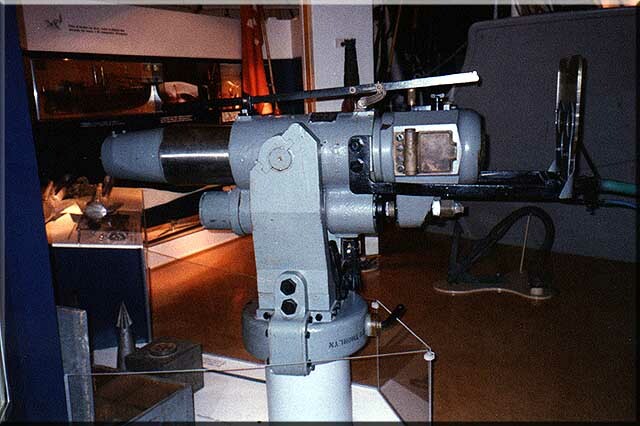 Prior to 1925 all guns were muzzle loading, but the introduction of breech loaders gave a better efficiency and smoother operation. 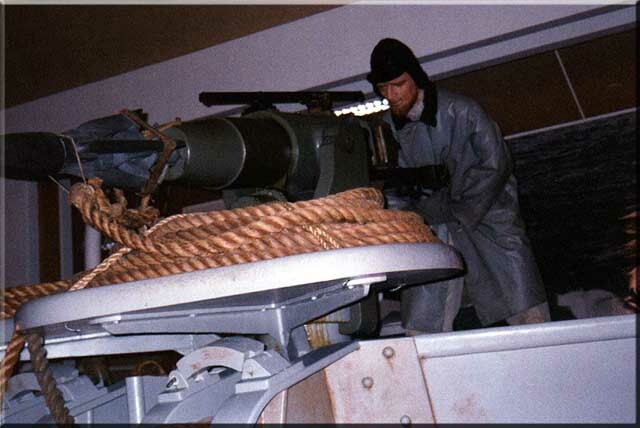 The first breech loading guns were manufactured the Norwegian Kongsberg Weapon Factory and AB Bofors in Sweden. A solid forged harpoon was patented by A. Andersen on the old Svend Foyn design. 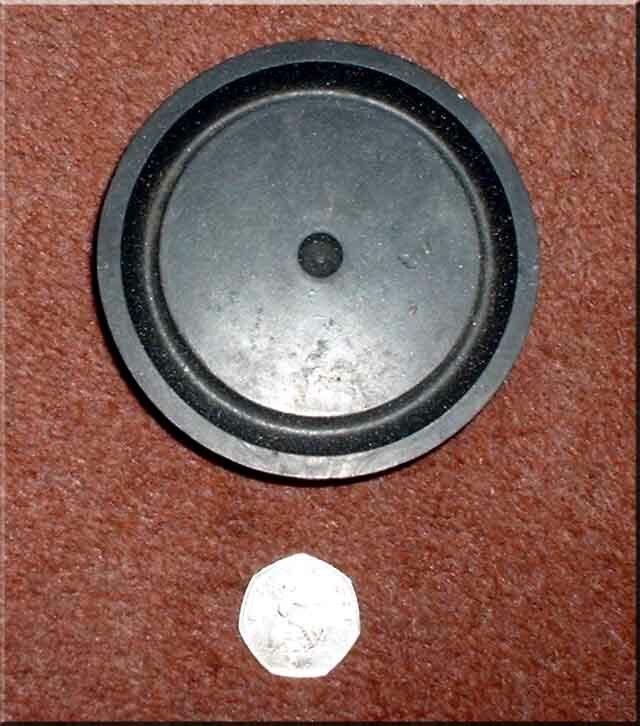 This is the rubber plug which was rammed down the barrel of a muzzle loading harpoon gun after it had been charged. The tightly fitting plug kept the sea water from dampening the charge. In the Natural History section of the Whaling Museum at Sandefjord are a number of exhibits covering most of the animals and birds to be found in the Antarctic. 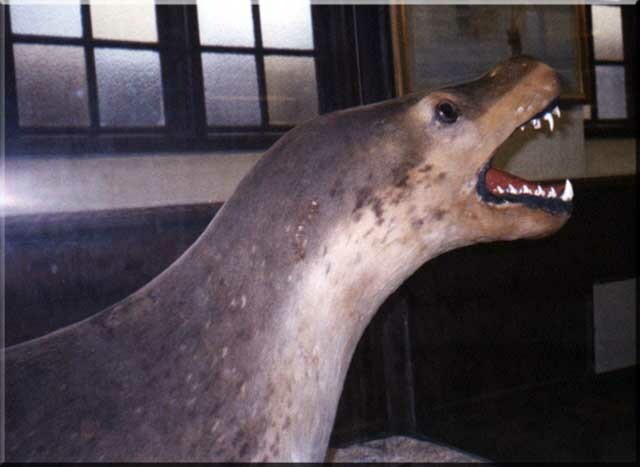 This is a very old specimen of a mounted, rather reptilian looking Hydrurga leptonyx, the Leopard Seal. Leopard Seals are solitary animals and very aggressive. After taking a look at these teeth, a museum specimen would be as near as any right-minded person would want to get to one of these animals. The females are much larger than the males, reaching a length of 4 metres.